Denim is always there and always even more talked about by the fashion world in spring and summer. This spring it's in the context of 90's Grunge, the 50's and Wild West Frontier style. I have bought two lightweight pieces for S/S 2012. I guess they are more 50's style. 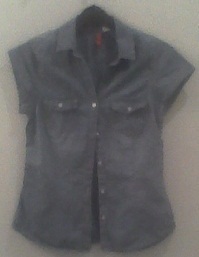 Short-sleeved shirt from H&M Divided. Jeggings with turn-ups from Calzedonia. Incidentally, Calzedonia have just opened a new shop in Kensington High Street.